In the opening seconds of Alien 3, Ellen Ripley (Sigourney Weaver, Rampart) crash lands on planet Fury 161. It turns out an alien xenomorph has survived along with our heroes from the last film and trashes their ship while they are in cryo-sleep. As the only human survivor of the crash (there's a lot of surviving going on), Ripley is quickly whisked into Fury 161's prison camp, run by the omnipresent and nefarious Weyland-Yutani Corporation. The prison has been closed down sometime before, and contains only a maintenance crew of "double Y" chromosome prisoners led by a righteous religious leader (Charles S. Dutton, Secret Window) and a bored, middle-managing warden (Brian Glover). The all male prison takes an instant dislike of Ripley, though they may need to rely on her as the alien begins to tear up the decrepit, low-tech facility. Alien 3 returns the series to its haunted-house-in-space roots, though isn't without its conceptual problems. These problems are largely the result of its stature as the third in a franchise of horror films. Long before robust continuity bibles and preplanned trilogy arcs, and with no source material to draw upon, the Alien franchise was in a corner. The "final girl" can only escape the boogeyman so many times before the audience tires of a series' predictability. While some fans, justifiably, were angered by the decision to kill off Newt during the opening credits, it perhaps was the only credible way to keep Ripley as a protagonist without repeating beats from Aliens. It's a cold decision that basically states that all bets are off and to ignore the previous installments. In fact, ignoring the first two films may indeed be the theme and purpose of this one. If Alien is broadly about the fear of reproduction, and Aliens is broadly about motherhood, Alien 3's stance is basically that none of that even matters. The film's underlying sense of nihilism is reflected in not only Newt's swift demise, but the prisoners' apocalyptic religion, assisted robot suicide and Ripley's weary, defeated characterization. If Alien 3 had a stronger third act, which is modified for the Assembly Cut, and didn't have its reputation for getting the ol' studio hack 'n slash, I suspect it would be held in much higher regard than it is. 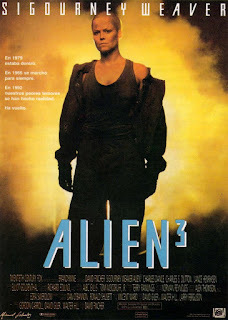 Alien 3 is David Fincher's first theatrical film as a director, and his style is already apparent, if in nascent form. Smooth tracking/steady-cam shots, expressive production design and a knack for gruesome post-crime details - all Fincher trademarks - are well on display. The writing of the film went through many stages, including drafts by sci-fi legend William Gibson and David Towhy (prison planets would feature prominently in his Riddick series). Final screenplay credit went to David Giler, Walter Hill and Larry Ferguson, with a story by nod given to Vincent Ward. Lance Henriksen (Necessary Evil), Charles Dance (Underworld: Awakening), Pete Postlethwaite (The Town), and Paul McGann (Queen of the Damned) also star. Alien 3 is a stylish, solid genre film and a worthy, if extremely dour, addition to Alien franchise. It may not be as ground breaking as the original or as exciting as the second, but Alien 3 does create its own identity while returning the series to its more low-key roots. While the Assembly Cut still doesn't feel "definitive" and it's doubtful that a true "Director's Cut" restoration of Alien 3 will ever exist, much less miraculously solve all of the film's problems, Alien 3 is undeserving of its reputation as a failure.